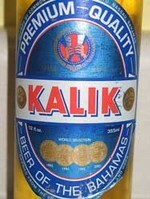 Kalik Lager is referred to as the “Beer of the Bahamas” by Bahamian natives and others who recognize this as the flagship brew of this island chain. Commonwealth Brewery of Nassau makes this beer and it is one of three products the company offers. Kalik is golden/straw in color and has a highly carbonated, clear body. These bubbles converge into a white head of foam that lasts for a very short time. The aroma of this beer is unusual, with scents of light grain but also some fruit and light spice/grassiness, leading me to suspect that Saaz hops are a key ingredient.